Peninsula Urban Forestry LLC delivers professional, expert sustainable landscaping and landscape design services using holistic techniques founded on permaculture. Sustainable landscaping design focuses on reducing human inputs to landscapes: reduced watering, reduced weeding, reduced upkeep, reduced fertilizer and reduced herbicide. Landscapes are an ecosystem, even residential landscapes. In sustainable landscaping we aim to redesign, reduce, reuse and recycle landscape elements. Need assistance with landscape projects? 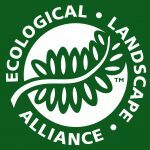 Sustainable landscaping, often called ecological landscaping, looks at landscapes differently. It incorporates not just plant and tree life, but other equally important factors like soil health, water conservation, energy conservation, wildlife habitat, food production and overall ecosystem function. All landscapes are ecosystems, from the smallest backyard garden to complex natural systems. Sustainable landscapes are planned, designed and installed to be resource efficient, increase ecosystem functionality and decrease negative impacts. Sustainable landscaping is biomimicry; planned and designed by nature. Ecology is defined as the interdisciplinary study of the biotic (living) and abiotic (non-living) environment and the interactions of and between those elements. Ecology seeks to understand the vital connections between plants and animals and the world around them. Ecology is rooted in the understanding and valuation of biodiversity (short for biological diversity) which is the range of variation found among microorganisms, plants, fungi, and animals. Some of this variation is found within species, such as differences in shapes and colors of the flowers of a single species of plants. Ecology also provides information about the benefits of ecosystems and how we can use Earth’s resources in ways that leave the environment healthy for future generations. Learning about ecology provides us with information to better understand the world around us which can help us improve our environment and manage our natural resources. Ecosystem Services are the sustainable benefits that people obtain from natural or built ecosystems. An ecosystem is the relationship between physical, biological and chemical interactions within a geographic area, below-ground and above-ground. An ecosystem can be a natural area like a forest or wetland, a back-yard of native plants, or a heavily urbanized area. 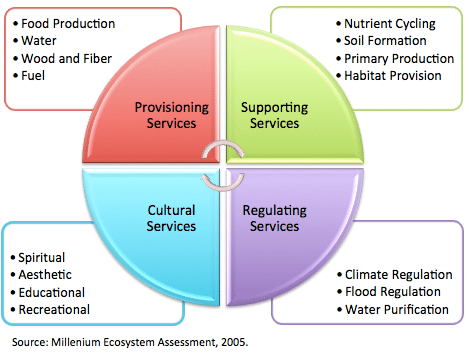 Ecologists have distinguished four categories of ecosystem services: Supporting -such as nutrient cycles and pollination, Provisioning -such as the production of food and water, Regulating -the control of climate and water and Cultural -such as recreational and educational benefits. Supporting services are regarded as the basis for the other three services and also includes (not show in the image at right) the maintenance of genetic diversity. Reduce heating and cooling costs with appropriate placement of plants and structures. Conserve water with rainwater harvesting elements and greywater systems. Stormwater runoff management: interception, transport, absorption, infiltration. Food producing, timber producing and other Provisioning Services. Water waste and consumption by installing drip irrigation, smart technology controllers, and rain sensors. Reduce green waste by mulch-on-site principles. Pollution and chemical runoff by reducing need for chemicals and fertilizers. Plant and tree mortality by selecting native plants and reducing weed competition. Energy costs by planting wind-blocks and shade trees in appropriate locations. Costs associated with landscapes by reducing necessary inputs! Salvaging plants from areas planted for disturbance. Wood from old or hazard trees for use in gardens or indoors. Fresh arborist wood chips from branches, leaves and needles of pruned trees. Ramial wood chips form orchard pruning projects. Wood from old structures for landscape features, fences, trellises. Use arborist chips from tree and shrub pruning on trails, pathways, and garden beds. Transplant shrubs and trees to more appropriate locations. Relocate diseased, pest colonized and other compromised organic material to green waste facilities to be used as compost. 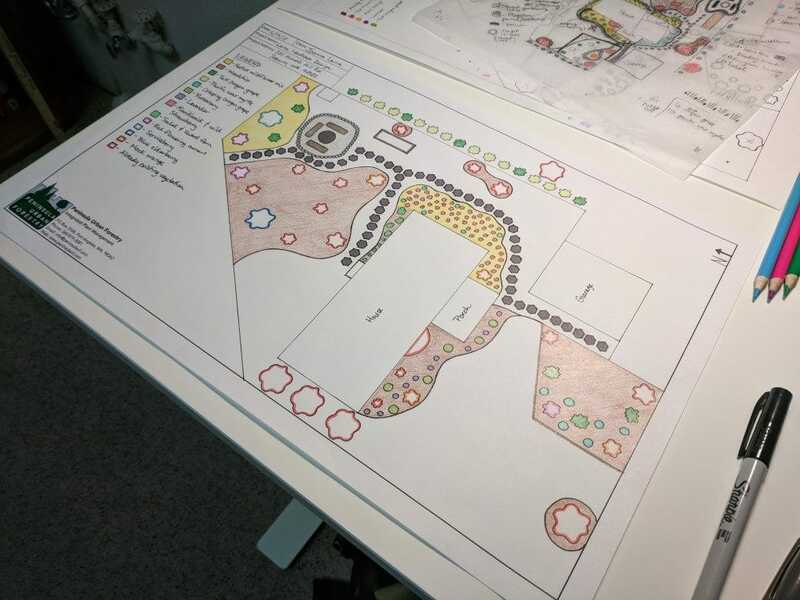 Are you looking for a permaculture consultation or landscape design?